A profile shows how you want to present yourself to your peers, students, and co-instructors. In your Illinois Compass 2g profile, you decide what you want to be called, share your academic interests, and more. 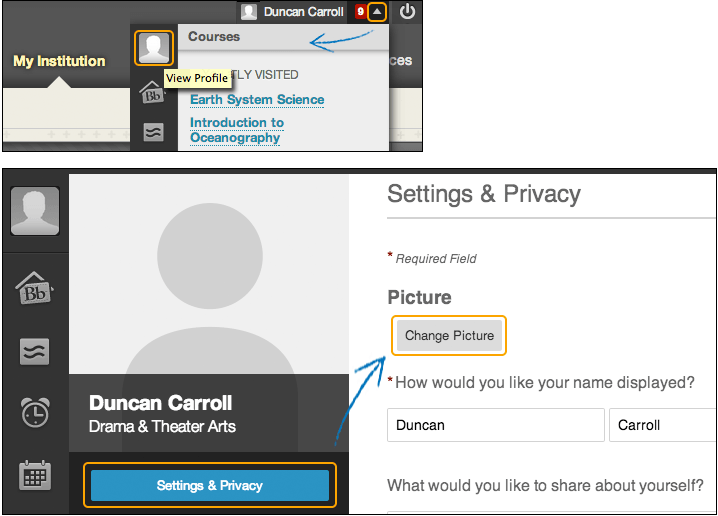 All Blackboard Learn users and system administrators can report inappropriate content they find in any profile by selecting Report. From a profile card, the user can select the flag icon in the bottom right corner. A screen appears and prompts them to fill out some brief information to report the profile. After a user's profile is reported, the system administrator sees a notification next to Reported Items under Cloud Management on the Administrator Panel. 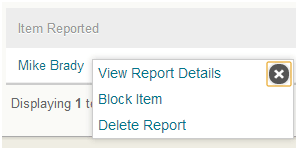 Select Reported Items to view all of the reported items. On this screen, you can take administrative action on the reported item. Next to an item in the list, open the menu to review the report and block the item from being seen by other users in your Learn instance. When you select Block Item, a message appears with more information about the action. Select Block to confirm that you wish to block the item. The system sends an email to the user telling them to revise their profile's content to have it reinstated. In addition to receiving an email, the user will also see a notification when they view their profile to let them know it has been blocked and must be edited and submitted for review. After the user has submitted an updated profile for review, a new Reported Item notification appears for the administrator. On the Reported Items page, you can see that the status has changed to Under Review. You can review the updated profile and unblock the item if it is acceptable.